It has always been my feeling that every piece of sophisticated training equipment should have a course or a guide explaining how to use it most effectively. After all, you’ve got to understand the basics but the small details can also make quite a difference …and when someone isn’t sure what to do, they either “do it all wrong” or soon lose interest, hence the reason why it is incredibly important to understand exactly what you should be doing. If you’ve already got a Gerard Trap Bar (or are thinking seriously about ordering one), you’re probably aware of what a uniquely effective piece of equipment it is.When used properly, the Trap Bar will help you develop incredible levels of strength. You’ll notice that the first three words in that last sentence were “when used properly.”While use of the Trap Bar may seem intuitive enough, if you want to get the most out of your training there is a great deal you’ll need to know about proper form for various Trap Bar movements, exercises that you may not be aware of, and how to work the Trap Bar into your broader training program.And who better ask about the Trap Bar than the man who invented it: Al Gerard himself? First of all, the Trap Bar is a serious piece of equipment meant for serious training. If you don’t expect to “pull” and deadlift some serious weights lest you get a few calluses, well then it isn’t for you and you can stop reading right now. Second, over the past two decades the Trap Bar has firmly established itself as a “must have” piece of training equipment since it does its job so effectively, yet there really isn’t a whole lot of material about how to use it. Imagine sitting down with Al Gerard face to face and having him teach you everything you would ever want to know about Trap Bar training – that’s exactly what you’ll find in this new training guide. We went back in the archives and found a Trap Bar training program that Al originally put together for an old issue of Powerlifting USA – that article is reprinted in full on page 27 of our new training guide. Al Gerard isn’t the only expert out there who has something to say about using the Trap Bar effectively. Dr. Ken Leistner has been a devoted Trap Bar user himself for over two decades and was one of the first to recommend it back in his “Steel Tip” newsletter.In Dr. Ken’s own words, the athletes he has trained “have found that certain exercises are definitely improved and have brought unexpectedly positive results.”In “Dr. Ken’s Trap Bar Workout,” we take another trip back in time, this time to an article written by Dr. Ken on Trap Bar training in 1989, reprinted here from Powerlifting USA magazine. In addition, we feature a previously unpublished training program written by Dr. Ken which he has used with great success with his trainees. 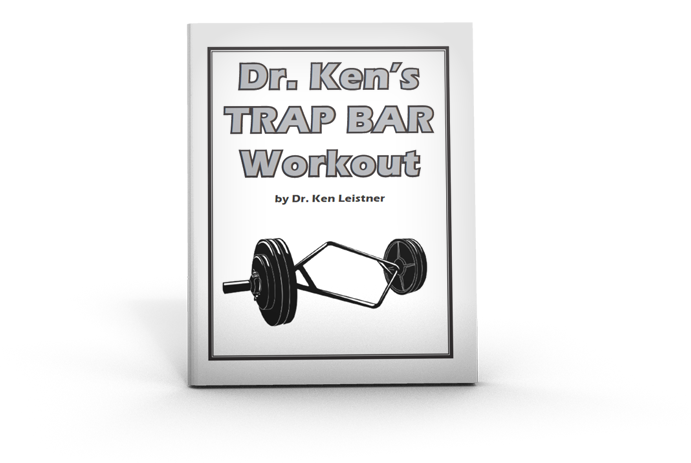 You’ll learn how to use the Trap Bar for Dr. Ken’s favorite Trap Bar exercises as well as recommendations on specific set and rep recommendations. This glossy training booklet measures 4-1/4″ x 5-1/2″ and has 28 information-packed pages and is fully illustrated. A few weeks ago I sent out a brief email of only a few hundred words talking about my recent training with the Trap Bar, and this generated an unexpected response. It seems a lot of people have questions about some of the details of incorporating the Trap Bar into their own workouts. In the spirit of never having too much good training information, I’ve expanded on my initial discussion and written a new Special Report – “The 5 x 2 Trap Bar Training Program” – that shows you some specific details of a program that I have been using with excellent results. You won’t want to miss it. If you want to get the most from your Gerard Trap Bar, you need to have solid training information. I can think of no better place to turn than the wisdom of two men who have benefited greatly from using the Trap Bar: Al Gerard and Dr. Ken Leistner. 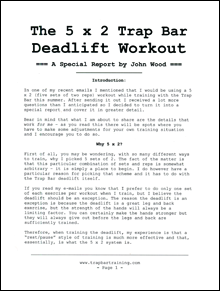 Oh yeah, and I’ve got a few things to say on the subject myself – so be sure to check out my new Special Report, which I’ll include free with every order for the 2-booklet set of Gerard Trap Bar Training Guides detailed above.